The Ricoh FAX1180L is a single desktop solution specially designed to fit environments with low-volume communications and imaging needs. 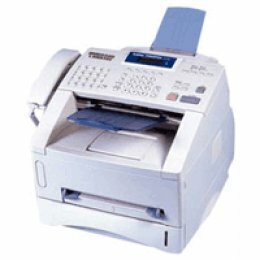 Its also a printer, scanner, and convenience copier. Each function is expertly engineered to provide unsurpassed reliability and speed.. This unit is New Energy Star compliant. Provide smooth, unattended transmission for contracts, proposals and other lengthy documents (up to 8" x 14" in size) with the 50-sheet Automatic Document Feeder. Send faxes to one or multiple recipients with superior efficiency using 40 Quick Dials, 250 Speed Dials and 32 Group Dials. Maximize speed and minimize long-distance costs with a 33.6 Kbps Super G3 modem. The system's 2MB, non volatile, stores up to 125 pages. During power loss, any documents in memory remain and then prints or transmits when power is restored. Expect error-free results, because the Ricoh FAX1180L supports printing on virtually all common Windows platforms.